At the time to start this initiative, all 12 companies agree Internet services company was aiming to create the experience of new mobile Internet, I will establish “Syn.alliance” a new coalition. The “Syn.alliance” is a coalition that is organized by the leading Internet service companies in a variety of genres. Total monthly number of users via each company services, up to 41 million which is Japan’s largest. 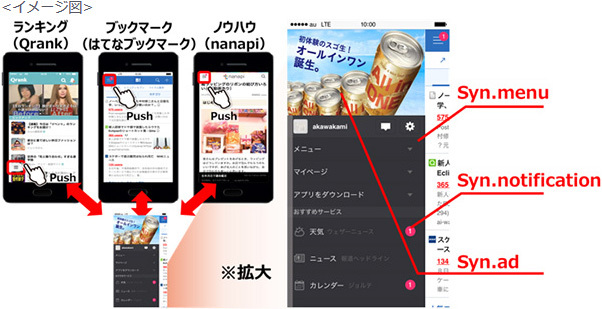 As a first step in service “Syn.”, From October 16, 2014, providing a common side menu (including app & web service) service of 13 “Syn.alliance” members to provide seamless service between each of You started to provide “Syn.ad” of the new advertising menu “Syn.menu”, and is displayed. Honda Joins Open Auto Alliance – ‘Droid Cars!